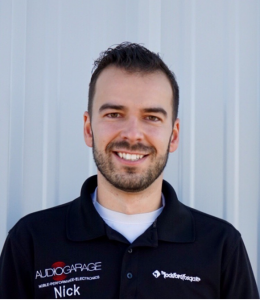 Nick is a 3M-Certified Paint Protection Installer, is MECP-certified, and attends the SEMA and CES shows yearly. He is also a certified welder, attends yearly remote start training and has completed JL Audio’s School of Sound training. If there is a training or seminar that can increase his knowledge level or skill set, he is there. Nick’s favorite vehicle would have to be the Porsche 918, because it was more like a piece of art than a machine. The carbon fiber is incredible, and the curves are sharp and precise. Everything in the car had a purpose that was custom-designed to make it a modern marvel. Nick loves to be outdoors. His favorite things to do would be hiking or biking up a mountain with his friends and family, getting whipped around on a tube behind a friend’s boat, or sitting by a campfire eating s’mores with the family.